Terrelle Pryor will start for the Raiders in Week 17 — so why is his agent angry? It’s not often you hear of a sports agent complaining about a client getting a chance to start, but there’s a first time for everything. 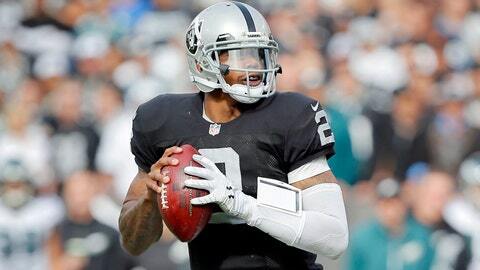 The Oakland Raiders announced Monday that Terrelle Pryor will start the team’s Week 17 matchup against the Broncos after sitting in favor of Matt McGloin for the prior six weeks. Pryor’s agent, Jerome Stanley, said the move is just a setup to get his client to fail, according to CSN Bay Area. Stanley said the dysfunctional Raiders, specifically head coach Dennis Allen, are grasping at straws in a desperate attempt to justify starting McGloin during a six-game stretch in which Oakland went 1-5. Allen is one of a number of NFL coaches who is in the hot seat after a dismal losing season, and Stanley said that’s why he’s setting a trap of sorts for Pryor. "I think they’re putting him in hopes that he fails," Stanley said. "That’s what I think Coach is doing. I think they’re putting him in hopes that he has a bad game, so he can then justify the Matt McGloin situation. I think that’s what’s going on, I do and it’s ridiculous. "[Allen] doesn’t want [Pryor] to look good because, if he looks good this week, it makes the past five weeks look like a bad decision. [Allen] doesn’t want him to look good, he wants him to look bad. That is what is going on." That could be the case, but it’s also possible that the Raiders are simply throwing up a Hail Mary at the end of their second consecutive 13-plus-loss season. Pryor has been little more than an accent piece for the Raiders this year after missing time with a Grade II MCL sprain. The Ohio State product has played sporadically over the past few games and didn’t see any action in the Raiders’ loss to the Chargers on Sunday. Pryor took to Twitter after Stanley’s comments made a splash and expressed his appreciation for the opportunity to play in next Sunday’s game against Denver. For his part, Allen quickly dismissed the accusation from Stanley, calling it the ”stupidest” thing he has ever heard and that he holds no ill will toward Pryor.